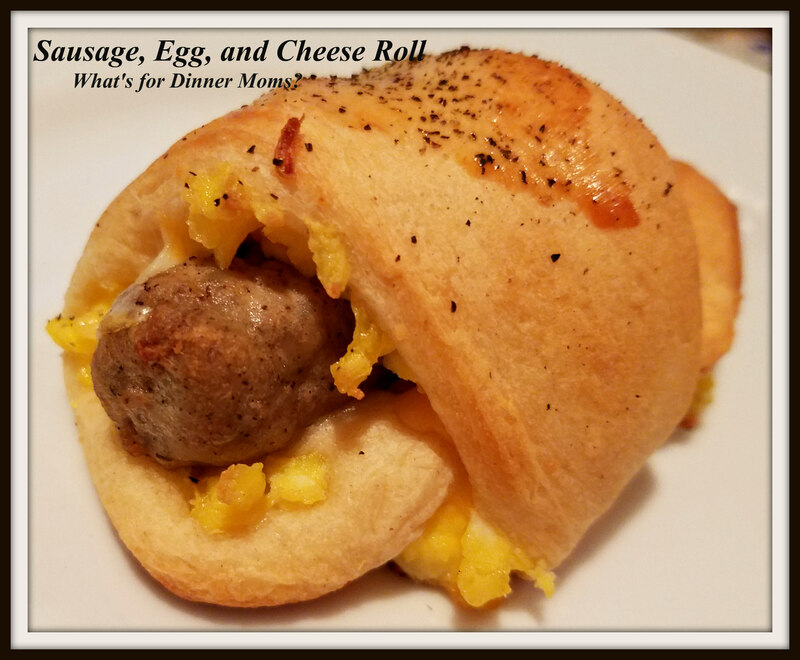 Sausage Egg and Cheese Rolls – Great Freezer Breakfast or Quick Dinner – What's for Dinner Moms? We are always trying to come up with easy breakfasts in our house. I do NOT make breakfast. Both children are old enough to make simple breakfasts on their own. I will sometimes have leftovers such as pancakes or waffles that we will double or triple the recipes to freeze for later breakfasts during the week but the kids have to toast or microwave them. 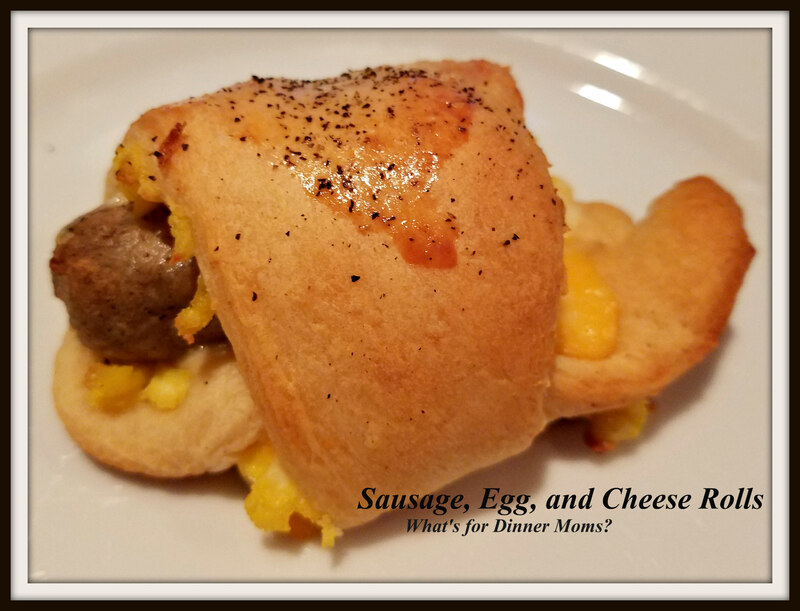 This is a great recipe from Pillsbury.com (click for link to original recipe) for breakfast sandwiches using their Crescent Roll. Why this is so good is you can change the rolls to English Muffins or Toast (give them both a nice toasting before freezing) or even biscuits. You can change the cheese to Swiss, Provolone, Pepper Jack, whatever you like. And change the meat to ham, bacon, Canadian bacon or even no meat. We originally made this batch to freeze for breakfasts. Let’s just say they did not make it to the freezer. I need to make 2 dozen of them and then I will have some for the freezer. As they were cooling everyone kept walking by asking, “Oh, these smell so good! Can I just have one?” Then one somehow became 2. So, my rolls were gone. But, the next batch will be back in the freezer as soon as the crescent rolls go on sale again in a few weeks. Serve these for breakfast or an easy dinner with a nice piece of fruit or a fruit salad. Preheat oven to 350 degrees. Prepare a baking sheet by covering the bottom with parchment paper. Separate rolls into triangles. Top each with 1/8 the amount of cheese. Make sure to leave the three points with nothing on them so that you can roll up the dough. In a small bowl beat the eggs. Remove 1-2 tablespoons to a small cup for brushing the tops of the rolls before baking. Scramble the remainder of the eggs. Divide into 8ths and place on top of cheese. Top eggs with a sausage link. Roll up into crescent rolls or completely cover them by bringing up ends and squeezing them together (your choice). Brush with raw egg on top of rolls. Sprinkle with salt and black pepper. Remove pan from oven and allow to sit for 1-2 minutes prior to serving. This is a nice quick fix breakfast an a great idea! Thank you, Marci! Thank you for all your support, Sylvester! It means a great deal to me. Hope you have a terrific day! You’re welcome, Marci! I appreciate all that you are sharing here. I hope you have a terrific day too! This looks like fun and yummy and easy!!! I love breakfast and this sounds like a wonderful idea for a breakfast treat. Thank you, Marci! We do ham and cheese in the crescent rolls and everyone loves them! Yum! I would love it with Swiss cheese! I’ve never in all my years of cooking made anything like this and Breakfast is my favorite meal of the day. So much so that I often do it for dinner, and will if given the chance have it for lunch too. Really. I’m saving this recipe and looking for a sale on crescent rolls which is something I have only made or purchased a few times! This sounds just that good! Thank you! It certainly is. Make their favorites – bacon and cheese, ham and eggs, etc… They will probably really like it!